Happy Friday, Friends! I was running late finishing up a quilt on Thursday, and wasn’t able to do a post. But here I am today, briefly, to announce the three No Scraps Left behind Giveaway Winners from way back when. An email has been sent to you asking for your shipping address. To kick off a series of posts to celebrate my STITCHING PATHWAYS book, I am giving away a panel — the SAME one used in my book’s panel quilt project so you can follow along my notes in the book to quilt this panel. 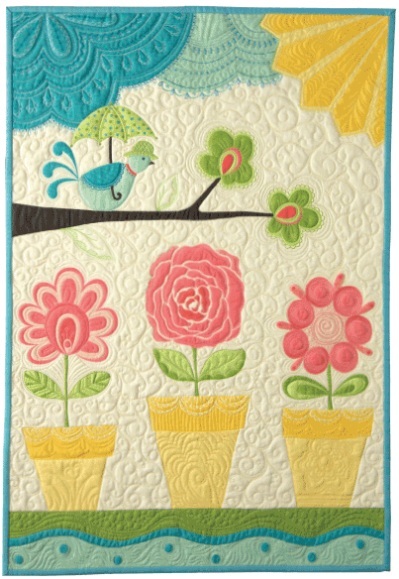 To enter the giveaway: Comment in the comment section a challenge you have when it comes to domestic machine quilting. Thank you to those who have purchased the book, as well as your kind comments on the book. Connecting Thread is having a sale on the book. Click here to purchase your copy. You can still purchase signed copies of the book from me as well. Please email me for details. That’s all for now. I hope you have a great weekend! I shall catch up with you later. p.s. There will be more giveaways of fabric boxes. I have been working on re-organizing my wardrobe, and happened to find MORE fabric boxes. At this point, I am truly embarrassed to admit just how much fabric I have hoarded! The major challenge I have is fitting the fabric in the available throat space. Would love to win this awesome panel. But must get a copy of your book. I have problems with bobbin tension. Recently it seems I hear a lot about using a lighter weight thread in the bobbin, but only in passing, never in enough detail that I feel confident trying it. If I’m using 40 wt in the top, would I use 50 wt in the bottom, for example? I’d love to improve! I think throat space and moving the quilt around through it is my biggest frustration. I could go to a mid arm quilting machine, but I have enough quilting paraphernalia. My biggest challenges are deciding what to quilt in particular spaces and getting my stitches to be fairly consistent in size. I have a hard time choosing new patterns for my FMQ. I tend to do the same “tried and true” designs. I need to stretch my mind a bit and be open to new challenges. Choosing a pattern! And we all know that it takes a lot of practice to be good at FMQ! Moving the quilt and keeping the motif uniform. I’m ordering this book! I’ve mastered “the squiggle” free motion quilting but need direction moving beyond squiggle :)! Now, about that panel…can it be ordered from somewhere online? I am type A and they never look nice to me. LOL. Too uneven. Right now I’m trying to get several quilts finished to give as gifts (and I want them done YESTERDAY!) I have a newer machine that I bought because of the larger area to the right of the needle, but haven’t done much w/FMQ on that machine. I tried and had a very difficult time moving the fabric. So, I’ve switched back to my older machine that I have more experience with, but it has the smaller space making it difficult to move the fabric. With either machine, I seem to have the same problem. Solution? Practice, practice, practice on the new machine. The problem w/that? lack of TIME! BTW, I loved that panel when it came out but missed my chance to purchase it. I hope I’m the lucky person to win it! I make BIG quilts, king and queen size; consequently, my greatest difficulty is man-handling that big thing through the harp of my machine. And suggestions? If I’m doing an all-over pattern, I sometimes find I’ve left a wider gap somewhere that is difficult to go back in to fill without the scale changing, or I sometimes box myself into a space without leaving enough echoing room to go to a new spot. It is becoming less stressful with practice. Lots of challenges…sewing even stitches…maneuvering the quilt…deciding what pattern to use, etc. I’ve been practicing a long time, now, but still need to work on control. I’m loving every minute of it. FMQ is so much fun! One of the challenges I have is knowing where to start. That panel is the cutest! It would be fun to follow the lesson and do that. I struggle with an even flat surface to quilt on. My project gets caught in the crack between an extra table and my sewing machine surface – so frustrating. I also struggle with even speed, but I’m persevering and practicing. P.S. 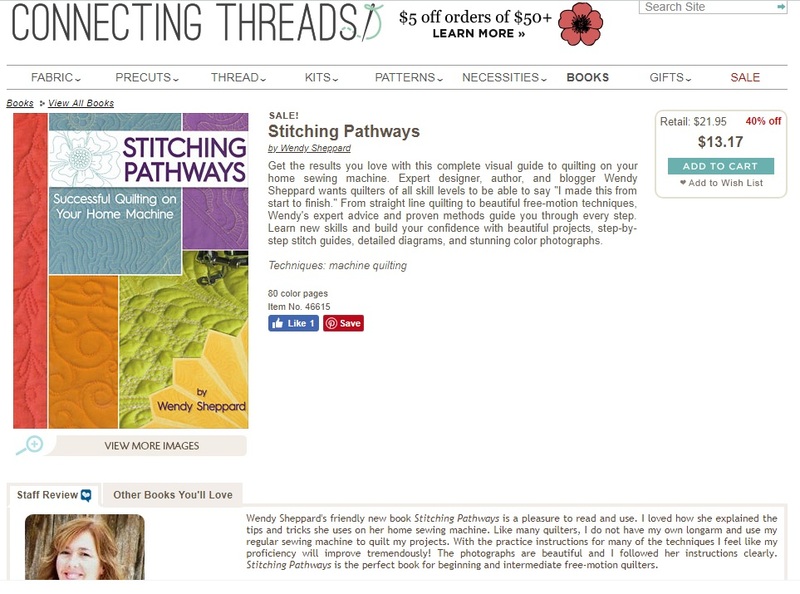 l’m lovin’ your “Stitching Pathways.” Sew much wonderful and useful info! I always struggle deciding on a design to quilt…. Deciding the design to quilt and maneuvering larger quilts through a small space on my home sewing machine is a challenge. Thank for the chance on your book00looks like a great one! My latest challenge was after I quilted my 12 1/2″ Dresden Plate blocks, I had to figure a way to get them attached together. I didn’t want to use the normal Quilt As You Go process because I didn’t want to attach them and lose 1/2″ to all the seams when attaching them together. So I decided to zig zag the blocks together and put sashing strips on the sides and below the rows to cover up the zig zaging. It turned out beautifully. It made quilting each block much easier. P.S. I love your book “Stitching Pathways”. I always struggle with “what to quilt”. I want my FMQ to enhance, rather than distract from my piece and sometimes fail. I then drag my heels quilting the next piece because I’m trying to make the next one more perfect. What’s a girl to do? Best wishes with the new book. Looks like I have to put that on my wish list! I have just about every challenge there is, but the biggest one is doing FMQ that I’m happy with. Moving the quilt without it catching on the edges of my desk. My biggest challenge and I know I’m not alone is the lack of space when I’m trying to quilt. I’m having to relearn how to fmq due to a stroke. Doing okay with walking foot and straight line. My guilds having a 2 day walking foot class next week that I’m going to. Thinking of a pattern to free motion is my biggest challenge. I like to look at books or Pinterest to get my creative juices going. I have my book, and I love it! my biggest challenge is moving a large quilt smoothly while stitching and not getting it in a bind. smaller pieces work best for me, but I want to be able to quilt larger quilts. its,also hard to decide on a,quilting pattern. I also need to overcome my fear of failure. thank you for your excellent instructions! congratulations to the lucky winners of the yummy boxes! This book appears to be a lovely treasure to provide encouragement to try some of your sweet designs, Wendy. I think my biggest challenges are being confident and trying out new ideas. I revert to overall patterns and wish I tried more custom designs. I love your book and purchased it mostly because I love the way you combine designs. I think one of my challenges is to quilt outside the lines and let the designs flow across the quilt, with wonderful designs that flow together. I have my copy and LOVE IT! I have trouble rearranging the quilt, in order to continue sewing evenly. I find it cumbersome moving the quilt through the machine. Those 3 dreaded words…QUILT AS DESIRED! Deciding what to quilt where. Looking forward to getting a copy of your book! My challenge when it comes to domestic machine quilting — I am literally afraid to just jump right in and do it. Hi. My challenge is just needing time. And occasionally finding the perfect design. Maybe I need to try rulers. I’m usually pretty good about doing even a larger size quilt, although I have 2 that need to be done soon, and have no idea on designs yet. Thanks for the inspiration (and I will be buying your book soon). Sending you and G hugs. I’m so proud of her. My challenge is speed. I quilt rather slowly and would like to improve that. Your book looks interesting. Will have to have a look. I can start. Two things I’m concerned about: choosing the design to quilt and getting the stitches even. I think it’s all a challenge but getting a rhythm going is a problem. I’m still learning, but I always have a problem deciding WHAT to quilt. But my biggest challenge is having only 6.5 inches of throat space. My challenge is consistent thread spacing and smooth pattern. On my newest machine swirls leave eyelashing on the back. When using my vintage Kenmore even stitch length is what I am working to achieve. My trouble is fitting the quilt neatly in the machine harp. Not much room there. I also struggle with uneven stitches sometimes. I have several problems, but two in particular stand out. One is the length of time, due to the way life has gone, in between quilting projects. I find I spend a lot of time having to re-learn what I’ve already learned before. And secondly, being a perfectionist is a giant issue. I’m working to let go of that. For quilting and sewing in general, I think a table that my sewing machine can sit flush with the table top would be a huge blessing. Echo stitching with equal or smooth stitching, maintaining equal spacing between rows is dismal. My biggest challenge is connecting motifs. I never know how/where to start the next motif. I have your book and would love to have the practice panel. It’s so cute! I have many challenges but the one that I really struggle is choosing designs to fill the space. The panel is adorable. With lots of practice I am getting better with my stitches! It is choosing what to quilt and being creative – that is where I get stumped! Your work is sew beautiful! Hard to decide on a single hardest thing about domestic machine quilting. I have two machines and each pose different problems. My older machine doesn’t handle circles and curves – bottom thread looks aweful – no matter how I set the thread tensions. I think it just wasn’t built for that kind of work. My newer machine does a better job making acceptable looking stitches. It’s a tough job holding on to and maneuvering the piece while keeping the stitches uniform. Biggest problem might just be fear – fear to practice, practice, practice on projects I’ve spent a lot of loving time cutting and piecing and want the quilting to be half-way decent. 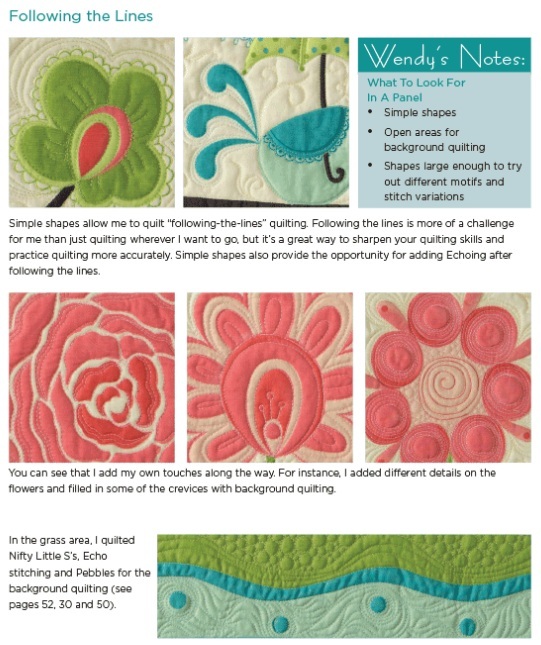 Hi, Wendy, just got my July/August issue of McCalls Quilting and saw your beautiful Sparkling Skies pattern. I noticed that in the last border there is some of the fabric that I won from you “destashing” project. It is a sign I should make this quilt!!! I just ordered your book from Amazon. I want so much to be able to do this! I just feels so awkward whenever I try. Can’t wait for the book! My biggest challenge thus far has been wrestling the quilt through my 6.5″ throat space. I find it very challenging to quilt curves and shapes smoothly. Getting the basting done in a reasonable amount of time! I have moved to basting spray, but still-the ironing, the centering the smoothing, ugh!!! Debating renting the long arm and baste with water soluble thread.